The Christensen family has been spending an awesome weekend at LEGO-land (Billund) so that is a good excuse for me to write a post on how to understand the impact of a corporate success story like LEGO on a small open economy with a pegged exchange rate regime like Denmark. Every kid in Denmark knows and loves LEGO – as do their parents. But LEGO is not just a loved brand in Denmark, but across the world. In fact the LEGO brand today undoubtedly is one of the strongest corporate brands in the world. “The name ‘LEGO’ is an abbreviation of the two Danish words “leg godt”, meaning “play well”. It’s our name and it’s our ideal. The LEGO Group was founded in 1932 by Ole Kirk Kristiansen. The company has passed from father to son and is now owned by Kjeld Kirk Kristiansen, a grandchild of the founder. And yes, the company has come a long way – and it is not only a “brick producer”, but also an extremely innovative company that continues to come up with great new products. In macroeconomic terms we can think of this as an increase in what macroeconomists call Total Factor Productivity (TFP). Macroeconomists rarely speak about companies and certainly very rarely about the importance of individual companies. The case obviously is that it is rare you would say that an individual company is large enough to have a major macroeconomic importance. Nokia’s success – and later its failure – and it’s importance for the Finnish economy, however, provides a useful example of a company, which have had major macroeconomic effect (See my later blog post on this here). Is LEGO such a company? I am not sure (I have not done a proper analysis of it), but it is nonetheless notable that the (renewed) global success of LEGO over the past decade to some extent coincides with a rather positive development in Denmark’s terms-of-trade. Another company – and likely even more important from a macroeconomic perspective – is the multinational pharmaceutical company Novo Nordisk, which also over the past decade or so has been remarkably successful internationally. The purpose of this post is not to analyse the magnitude of the macroeconomic impact of LEGO’s success, but rather to look at the mechanisms that are in play. However, I believe the easiest way to think about LEGO’s macroeconomic impact is to think of the success of LEGO as a positive Total Factor Productivity shock, which essentially increases the competitiveness of the Danish economy. Said, in another way the success of LEGO (and Novo Nordisk for that matter) has caused an improvement in Danish terms-of-trade (export prices have risen relative to import prices). As LEGO is a major play on the global toy market and because the global toy market is an imperfect competition market, with differentiated products, LEGO has some pricing power in the global toy market. Consequently LEGO can therefore ask for higher prices for its famous bricks than otherwise would have been the case. This of course is why LEGO’s success supports Danish terms-of-trade. 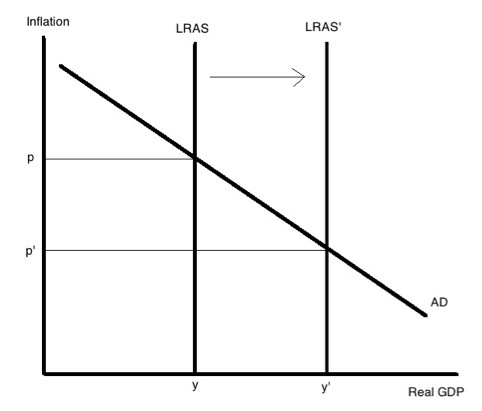 In an AS/AD set-up we can think of this as a positive Aggregate Supply (AS) shock, which shifts the long-run AS (LRAS) curve to the right. The graph below this illustrates this. 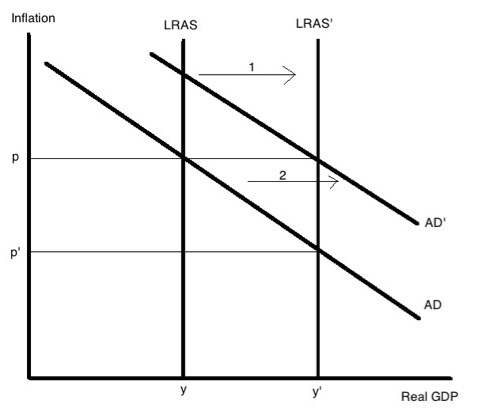 Notice that I here look at the AS/AD framework in terms of inflation and real GDP growth rather than in terms of the price level and the level of GDP. You see here that the positive AS shock causes Danish inflation to drop (from p to p’) and increase real GDP growth (from y to y’). This should of course not be confused with LEGO’s prices (or Danish export prices). The improvement in LEGO’s TFP causes LEGO’s prices (and Danish export prices) to increase relative to Danish domestic prices. Essentially a positive TFP shock means that Denmark is becoming a more wealthy nation, which in turns causes wages, profits, property prices, equity prices and real GDP etc. to increase. That is pretty awesome. However, this is not the only impact we have of a positive TFP shock. Hence, as Denmark operates a fixed rate regime supply shocks will also cause a quasi-automatic change in monetary conditions. When TFP improves it causes an improvement in Danish competitiveness, which then leads to an improvement in Denmark’s trade balance and the current account. This will tend to strengthen the Danish krone. However, as the Danish central bank pursues a fixed exchange rate policy it will counteract the strengthening of the krone by easing monetary policy – either by cutting the key policy rate or intervening in the currency market. This process of “counteracting” monetary easing will in our AS/AD framework cause the AD curve to shift to the right, which will cause inflation to rise (back to p from p’) – offsetting the downward pressures on inflation caused by the initial positive TFP shock. This process will essentially continue until the “competitiveness effect” of the positive TFP shock has been eroded by higher inflation due to monetary easing. This is what Hayekians would term “relative inflation” and Hayekians would also argue that this could lead to economic misallocation. The problem from a Hayekian perspective is not the positive TFP shock – LEGO’s innovative success – but the monetary response, which directly follows from Denmark’s pegged exchange regime. But nonetheless there is given Denmark’s monetary regime a link between LEGO’s improved Total Factor Productivity and the development in Danish monetary conditions. The international success of a relatively few Danish companies such as Novo Nordisk and LEGO over the past 10-15 years likely has played a much bigger role for the overall performances of the Danish economy than is normally realized – both by economists and by the wider public in Denmark. 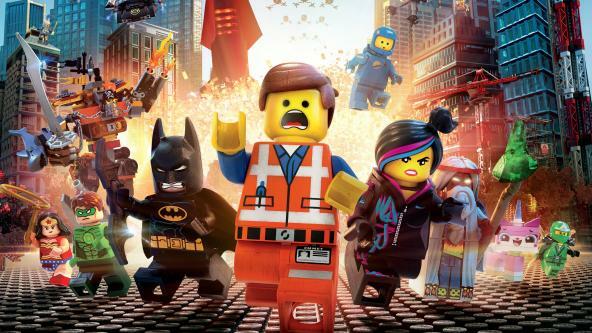 My kids think LEGO is awesome (as do I) and so should Danish taxpayers, labour unions and consumers think.